Dental crowns have been around for a couple of thousand years. Archeology suggests that the Etruscans experimented with crowns on teeth using ivory and bone as early as 700 B.C. By 200 A.D., gold crowns were used to make artificial teeth. Ancient Egyptians fashioned tooth replacements out of seashells and then hammered them into their gums. The material used is determined by several factors, depending on your unique situation. You will want to discuss this with Dr. Stewart and Dr. Hull which option would be best for you. If you suspect you need a crown, want to replace an old crown, or want to learn about other cosmetic dentistry procedures, call Dr. Stewart and Dr. Hull at 616-827-7019. We have been serving patients in the Belmont, Grand Rapids, Sparta, Walker and Rockford, MI area since 1974. 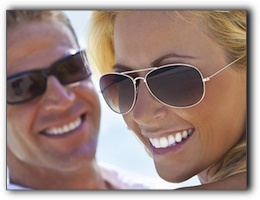 We can recommend the best tooth restoration or cosmetic dentistry option for you.